Say this name and eyes will light up, talk will turn to some of the famous songs she's written, or some of the country or gospel stars who have been inspired by her, learned from her. Here is Marijohn's biography—the chronicle of a life that came early to Jesus, then strayed from him and nearly ended in tragedy. the magnetic pull of the upside-down world of "the Nashville Scene"—its drugs and alcohol. How Marijohn has responded to life's demands makes fascinating and inspiring reading. You'll learn much from what she reveals of her feelings about her own failures and successes—the heartbreaks, hard work, and lean times: the God-given talent that has produced so many hits from 1959's "Waterloo" right on to such recent masterpieces as "The Scars In the Hands of Jesus" and "I Have Returned". 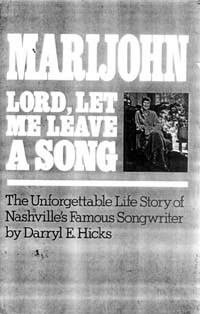 Comments and reminiscences from friends, teachers, performers, songwriters—many of country and gospel music's most famous figures—add even more insights to Marijohn's remarkable story. Here is a gripping account of a determined woman's search for a focus in life. Darryl E. Hicks is an artist, songwriter, teacher, singer, and preacher, as well as writer. He has written several biographies and performs with his band, "The Darryl Hicks Trio". He and his wife Karen live in Eagle Springs, North Carolina.